Whenever the Jewish holidays arrive, my mind starts wandering to Pomegranate Molasses. I absolutely love this condiment (the homemade kind, not the bottled! ), and I’m always looking for new ways to use it. Pomegranate is often eaten on the second night of Rosh Hashanah to represent “new fruit”– a fruit that has just come into season, one that we haven’t yet enjoyed during the year. Pomegranates are mentioned several times in the Torah; it is said that each pomegranate contains 613 seeds, corresponding to the 613 mitzvot (or commandments) found in the Torah. The pomegranate also reminds us that in the coming year, our good deeds should be as plentiful as the fertile seeds of this beautiful fruit. The layered symbolism and rich, robust flavor makes pomegranates one of my favorite holiday ingredients. Last year, Pomegranate Molasses Brisket was on the menu. This year, I decided to create a new salmon recipe. I knew I wanted to sear the fish on the stovetop before transferring it to the oven, so it would get a nice crust– but I didn’t want to burn the pomegranate molasses, so I had to glaze it after the searing. I got some helpful tips from America’s Test Kitchen on getting the glaze to stick after the sear by coating the fresh fish with a cornstarch mixture (I also tested it with potato starch, which worked great). I seared the salmon, glazed it, and finished it in a moderately hot oven. This created a perfectly glazed, foolproof salmon with an incredible flavor. – Use my recipe for homemade pomegranate molasses (click here for the recipe). The bottled stuff is much more tart, and doesn’t have the thick, rich consistency of homemade. It’s really easy to make, and a jar will last in the refrigerator for several months. – Make sure your pomegranate molasses is at room temperature before you begin. This will allow the glaze to spread evenly across the delicate surface of the fish. Refrigerated molasses has a hardened consistency that will not spread easily. – Use a nonstick skillet. 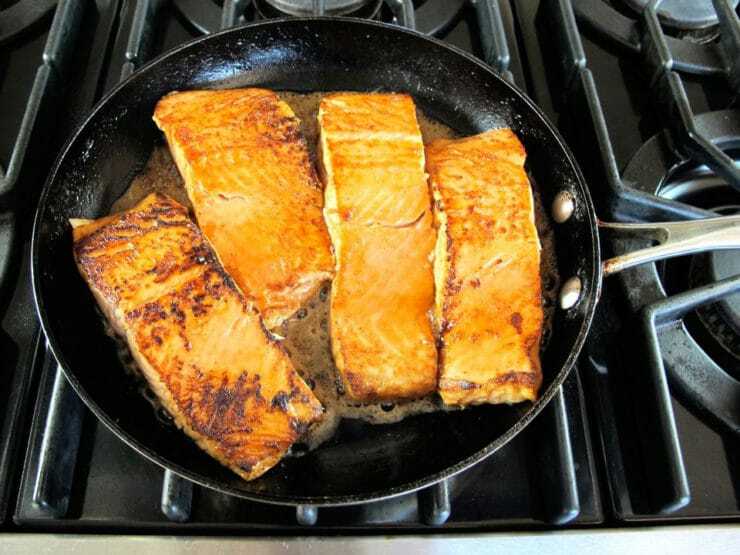 Salmon is too delicate for a regular skillet, even with oil. 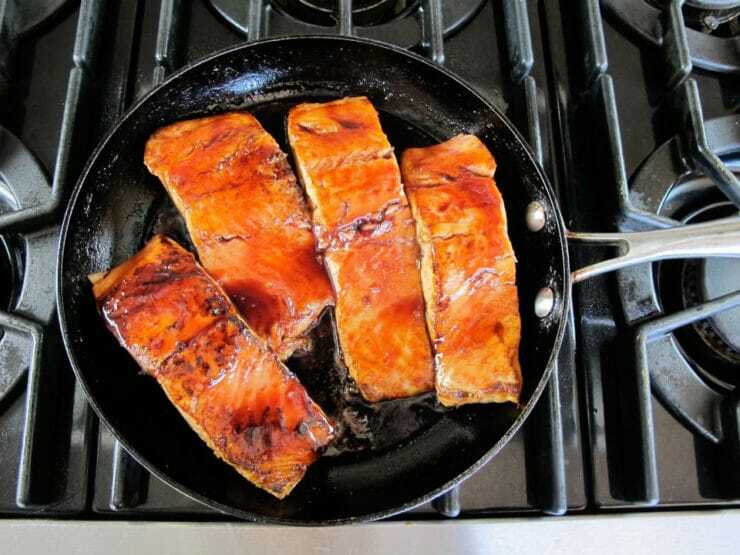 You’ll need the nonstick to keep the salmon from breaking apart as it cooks. – Don’t crowd the pan as you sear the fish. Salmon is delicate and difficult to turn without breaking, and a crowded pan makes it even more difficult. – If you have to cook a lot of salmon for several guests, it’s easy to multiply this recipe for more servings. Sear the salmon in batches in the skillet first, then transfer to a larger baking sheet for finishing in the oven. 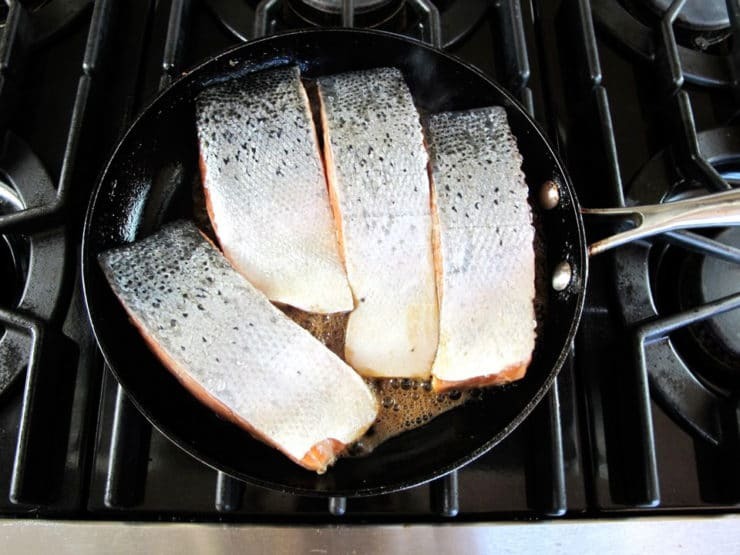 – To start your fillets ahead of time, sear them and place them on a baking tray up to one hour before your meal time. Glaze and finish them in the oven just before serving– it takes only 10 minutes or so to finish the fillets. – If you’re making this recipe for Passover, you can easily make it kosher for the holiday by using potato starch instead of cornstarch. The flavor of this salmon is really awesome. 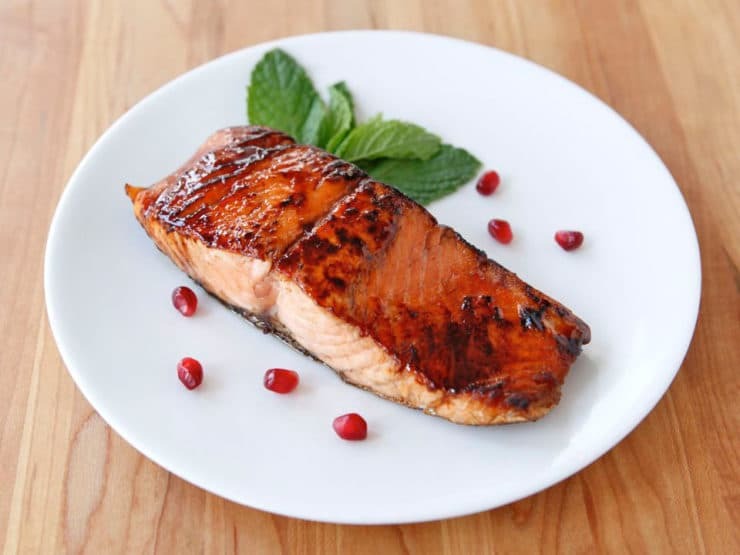 The pomegranate molasses combines with the salted brown sugar crust, caramelizing and infusing the salmon with a wonderful teriyaki-like flavor. It’s gluten free and all natural. I served it to a friend recently, who declared it was the best salmon he’d ever tasted. High praise! The best part? It’s super easy to prepare, especially if you make the pomegranate molasses a day or more in advance. Garnish it with pomegranate seeds and fresh mint for a beautiful holiday presentation. 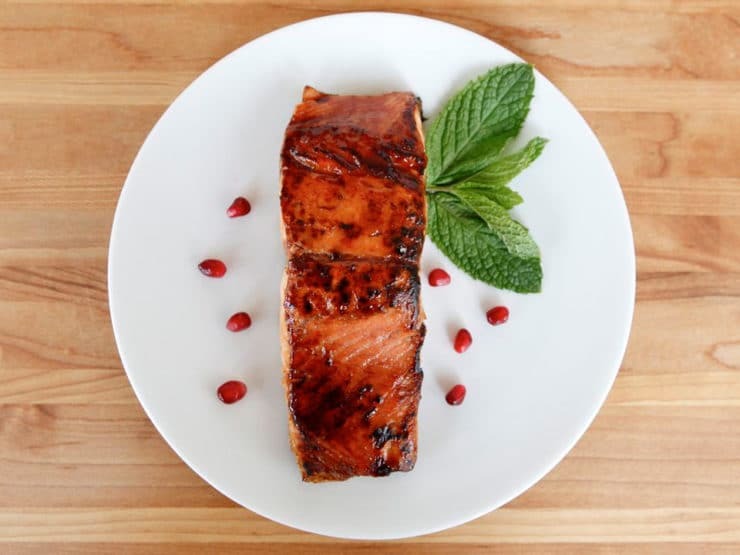 Salmon seared and glazed with pomegranate molasses, finished in a slow oven for a perfect, caramelized finish. Rosh Hashanah, Kosher, Pareve. Spray nonstick skillet generously with cooking oil and heat on medium high till very hot. Place the fillets skin side up, flesh side down into the skillet and allow to sear for 1-2 minutes till a dark crust forms. Be careful not to overcrowd the pan-- this will make the fillets difficult to turn. If the pan seems too crowded, work in batches. When a dark crust has formed (it should be crispy and even a little black in places), use a pair of tongs to gently turn the salmon and let the skin side sear for another minute. Remove skillet from heat. At this point, you can transfer the fillets onto a lightly greased baking sheet. If your skillet is oven safe - no plastic handle, heat resistant - you can finish the fillets directly in the pan. Brush each fillet with 1 tbsp of pomegranate molasses. Transfer fillets to the preheated oven and let them cook for 8-12 minutes longer, till internal temperature reaches 125 degrees F or until desired doneness. Serve fillets fresh from the oven garnished with fresh pomegranate seeds and fresh mint, if desired. – I found the amount of the cornstarch/sugar/salt mix to be barely sufficient for the amount of fish here. I might consider doubling or tripling it to really be able to “dredge” the fish through. – Similarly, we had thick pieces, and needed double the cooking time in a 300 oven. Perhaps, as someone else mentioned below, 325 might work better for thicker fish. Otherwise, it’s easy, tasty, and accessible. Highly recommended. Woops- I bought skinless salmon- will this work?? Yes, no worries! I use skinless for this recipe too. It’s a little more delicate and the fillets can fall apart easier, so handle with care. prepared and in the refrigerator? When we get home from synagogue I can put in the oven. Will that be ok? Hi Miriam, I do not recommend searing the salmon in advance. You can season the fillets with the brown sugar, salt, pepper and starch ahead of time, but it won’t really save you much time and it will work better done fresh, so I recommend simply having the ingredients pre-measured and ready to go. You should sear the fillets, brush them with glaze, and finish in the oven just before serving. This is not a great dish to “make ahead,” but it can be done very quickly if the ingredients are measured out and ready to go. This is a fantastic recipe! Have made it for company on two separate occasions and received rave reviews (and clean plates!). Great recipe! I made it tonight.. it’s simple and delicious! Thanks so much! Can I sear this on a nonstick griddle? Hi Pearl, Tori’s assistant Ashley here. My only concern would be that the sugar in the pomegranate molasses would burn using this method, but I can’t say for sure. I make salmon for my vegetarians when we entertain. I buy fresh wild salmon. I have always had the fish monger portion the salmon and to remove all bones and the skin. I wanted to make something different and your recipe has intrigued me. It sounds great, but as a non fish eater I wanted to ask you a couple of things. Do you normally eat the skin? Would I be detracting from your recipe if I had the skin removed. Is pan searing crucial? If you have a guest that doesn’t eat mint is there another herb that would compliment the pomegranate sauce? Any advice would be appreciated! The pan searing is critical to the flavor of the final product. You may remove the skin, and will probably find it easiest to do this after cooking, when it should slip right off, unless you ask the fish monger to remove it before cooking. I don’t normally eat it but some people do and like it, it’s a personal preference. You may omit the herb completely, or place it on a bed of fresh spinach or mixed herb salad if you prefer to have some green. Enjoy! is it possible to make a marinade w this and use it on a whole side of salmon to broil? Hi Lauren, this recipe is meant to glaze the salmon, not marinate it. I don’t know how it would work as a marinade because I’ve never tested it that way. Thanks for all the great recipes, and I’m looking forward in trying this one! Do you think it would work as well using sea bass instead of the salmon? Thanks! Hi Laura! To be honest, I’m not so sure about seabass here. 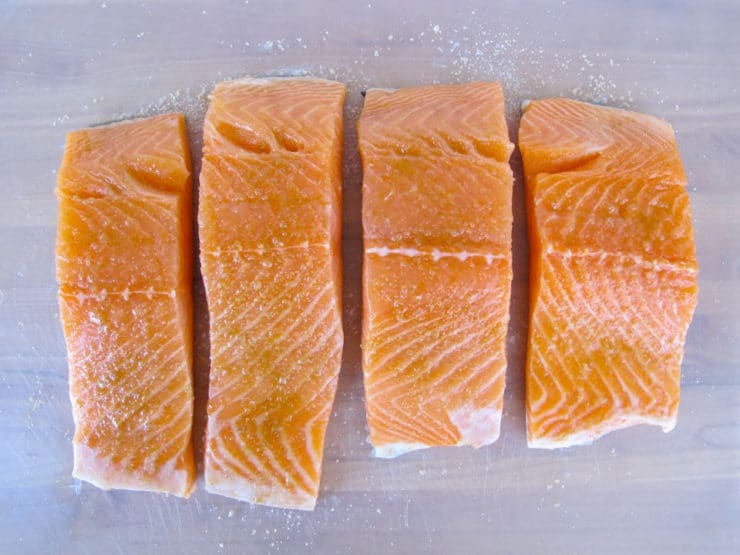 The sweet tangy flavor really suits salmon, and I’ve never tried it with another fish. It might work though. If you give it a try please let me know how it goes! Sooo excited to try this. !!!!! Our family eats pomegranates on both nights, as a symbol that our good deeds may increase just like the many seeds of the pomegranate. My question…. cover the salmon in the oven? Thank you! ! Hi Dina– nope, don’t cover, as it continues to crisp and caramelize in the oven. Enjoy! If you make the salmon in the oven and use a temperature of 325, approximately how many minutes on each side would you cook the salmon? Thanks in advance for your reply. Hi Tammy– this recipe calls for 300 degrees, and you only cook on one side– the searing in the pan takes the place of cooking the other side. I have not tested it for other temperatures so I wouldn’t be able to tell you how to modify. Best to cut into the thickest part of one of the fillets to test for doneness. This recipe looks delicious. I am wondering about the addition of the corn starch or potato starch. Is it necessary? Hi Bev– yes, it is very necessary if you want to achieve that nice caramelized top. It helps to keep the glaze from slipping off in the heat of the oven. Tori, you were right! We tried a sear on a cast iron griddle on the BBQ but it did not work well. And such, the molasses slipped right off. We brushed some on before serving it but I definitely will make it next time per your recommendations. I have plenty of the pom molasses left – what a gem of a recipe, thank you! Good morning, Tori. I am so excited to make this recipe with the pomegranate molasses. Being summer, I was planning on BBQ’ing the salmon and brushing on the glaze at the last few minutes. What do you think? Hi Laura– I’m sure it will taste great, but it may not get the nice crust that you would get from searing. You might want to do the searing step, then brush them with the molasses before throwing them on the grill. This will help to give it that nice glazed crust. Enjoy! I just bought Pomegranate Molasses (sorry, yes, the bottled kind!) but only because I tried making it myself and it was a disaster. I have not opened it yet but once I do (to try THIS recipe) is it safe to keep away in the pantry and not refrigerated once opened? Hi Sarah, to be safe I would keep it refrigerated. On some of those Middle Eastern products (pom molasses, rosewater, orange blossom water, etc.) there is no note about refrigeration, however I have read that they can be a breeding ground for bacteria. Always better to be safe than sorry in that department. Those are my two cents, anyway. 🙂 The bottled molasses likely won’t be nearly as sweet as my recipe… you may want to stir in a little brown sugar to compensate, should you find the flavor very tart. If you’d ever like to troubleshoot homemade molasses let me know, I’d be happy to help. I’m all ways looking for new recipes. This looks great and I will try to cut down on the sugar in the molasses. Hi, I just love your website. The recipes are so clear and your photos are beautiful. For me, they are better than watching a video of how recipes are prepared. I plan to try several of your recipes for Passover this year. Thank you. This dish looks amazing! I’m planning to make it a day earlier for passover. Will that work with searing the fish a day before and adding the glaze the next day? Hi Lea, I do not recommend making this dish ahead. It is best served right after it’s cooked. Thanks for creating this new recipe. First I have made a nice pomegranate molasses (thanks to you I am much faster now at seeding pomegranates! — It is really easy ;-)). I then glazed the salmon with it. I waited anxiously for the result. It was tender and loaded with taste, really awesome! Thank you! This recipe is delicious. Making the molasses turned out to be a lot easier than I thought it would. This recipe is delicious! I was a bit skeptical in making the pomegranate molasses but it was so easy. I have already tried the molasses on ice cream and will definitely keep some in the fridge. I am a true “shiksa” and tribal supporter of my husband and sons. So happy that I found your blog. It is beautiful!! I’m bringing this dish to a break-fast tonight. But I’m considering staying home and eating all three pounds of this delicious salmon by myself! Thanks for another terrific recipe, and g’mar hatima tova! Good morning, I featured this recipe on my blog today for my weekly seafood round-up. I also FB, Tweet and Pin. Thank you for allowing me to share! Hi Elina– yes, why don’t you try that. Stir brown sugar into the molasses till the sweetness tastes right to you. It should be sweet, but still have a nice tartness to it, with a spreadable texture (not overly thick). Good luck! Hi! Just discovered your wonderful blog while searching for Rosh Hashanah recipes for a catering client – I’m not Jewish, so I really appreciate the details you provide baout the recipes and the significance of the various foods. I will be preparing 2 holiday meals – one on Sunday for 10-12 family members; one of Monday for a group of 26. Salmon has been requested for Sunday’s dinner. Because the client wants that meal to be prepped and ready for them to pop[ in the oven, I was going to prepare several salmon filets. I love this recipe, so my questions are: 1) this would work OK with the pomegranite brushed on the filets before going in a high heat (425-ish) oven? 2) My clients are not Orthodox but do try to keep moderately kosher. Since you’ve suggested that pomegranites be served on the 2nd night of Rosh Hashanah, would it be terrible to offer this on the first night? The menu for the 2nd night is brisket and roasted chicken. Hi Margie– I would not cook the fillets at 425. The pomegranate molasses has sugar in it, which has a tendency to burn at higher heat. Though it probably won’t burn in the short amount of time it takes to cook, it’s better to be safe than sorry, especially when you’re dealing with several fillets. I wouldn’t cook them higher than 325. They cook very fast, even in lower heat, and at the low temp they’ll turn out prettier (less white gunk on the sides) and more moist without any chance of burning. With regards to the pomegranate question, it likely won’t be a problem, since the pomegranates are symbolic more than anything. However, I would double check with the family to be safe– every family tradition is different. Good luck! Salmon is so quick and easy to make, I sometimes wonder why I don’t make it more often. The pomegranate adds such a pretty color. Beautiful photo! Where do you buy pomegranates? I never see them anywhere!! Hey Julia! They are kind of tough to find, aren’t they? I just saw some in Trader Joe’s this week. As we get closer to Rosh Hashanah, most Jewish/kosher markets will carry them because it’s a traditional holiday food. Wal-Mart and other stores have loose Pomegranates in cups at $3.00 per cup…..I buy them……or try other supermarkets. This is gorgeous!!! BTW, it was SO nice to meet you at the IFBC! Great meeting you too Claire!